Dentists say the proliferation of “natural” toothpaste, aka fluoride-free, will usher in epidemic of dental decay. Natural toothpaste company Grin and Massey University are fighting over the use of the university’s research. Grin is citing research by Massey microbiologist Dr Tony Mutukumira, claiming it confirms their fluoride-free toothpaste keeps teeth healthy. The study, which Massey commissioned in 2015 but was funded by Grin, tested how seven natural ingredients reacted to six common oral bacteria. 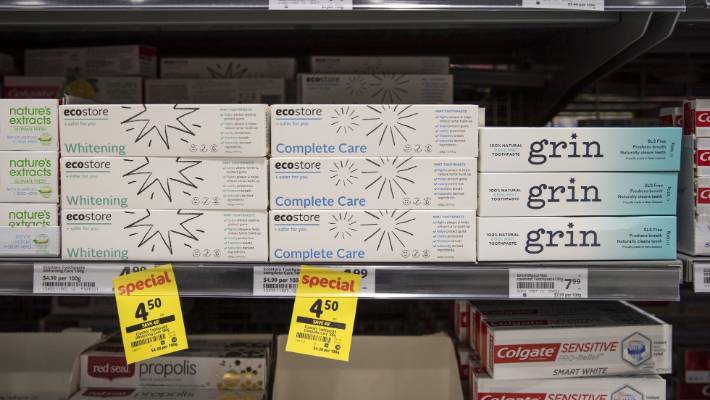 DAVID WALKER/STUFF – Dentists say the proliferation of “natural” toothpaste, aka fluoride-free will usher in epidemic of dental decay like NZ hasn’t seen since the 1960s. Mutukumira and Massey say Grin is using the research without permission and in a misleading manner. But, Grin says it owns the research and has a right and a responsibility to use it. Dentists have criticised the natural, fluoride-free toothpaste trend, saying it will bring an “epidemic of tooth decay”. The New Zealand Dental Association has taken its concerns to the Ministry of Health. A Massey University spokesman said the research contract with Grin required written permission to use the name of the study’s author or the university in endorsements — and this had not been given. Mutukumira asked the company to remove the study reference on the website two years ago. He said it did not prove the toothpaste ingredients reacted the same way in humans. Grin Natural Products toothpaste contains natural ingredients including Manuka oil, Magnolia bark extract and organic sea salt, and highlights it is gluten free. Grin director Tara Tan said the testing and report was part of a commercial contract with Massey University and Grin had “full ownership of the test results”. She said the company would remove the reference to Mutukumira and the university from the website as soon as possible, but would not remove the study findings as they were “robust and accurate and are not in question”. The Grin website says the study found seven natural ingredients in their 100 per cent natural toothpaste had a “strong ability to inhibit the growth of the six common oral bacteria when incubated at 37 degrees Celsius over a 48-hour period”. The test took place in a laboratory test tube or culture dish rather than a human mouth, and was not peer reviewed. This was not the first time Grin, which was started in 2015, has come under fire for being misleading. In 2016 Grin was forced to change claims its toothpaste “reduces tooth decay” and “helps reduce cavities and plaque build-up” after a complaint to the Advertising Standards Authority (ASA). The ASA complaint also challenged Grin’s claims about Manuka oil and the complaint was upheld despite changes to the wording. Otago University dental public health associate professor Dr Jonathan Broadbent said the study did not provide evidence the ingredients would do anything to combat dental decay. A dry toothbrush would be equally effective in removing plaque as Grin toothpaste, Broadbent said.